1972-11-01. Good. Ships with Tracking Number! INTERNATIONAL WORLDWIDE Shipping available. May not contain Access Codes or Supplements. May be ex-library. Shipping & Handling by region. Buy with confidence, excellent customer service! NY: Holt Rinehart Winston. (1973). The uncorrected proof copy. Signed by the author. Near fine in tall wrappers. With a "Special Note" from the publisher laid in explaining that the proof lacks many of the design features of the published text, which took the form of a literary quarterly. First Edition. Softcover. Near Fine. New York: Holt, Rinehart and Winston, 1973. First edition. 1 vols. 8vo. Brown cloth. Fine in Fine dust jacket. First edition. 1 vols. 8vo. New York: Holt, Rinehart Winston, 1973. First edition. Hardcover. A very good copy in a near fine dust jacket. First edition. A parody of a literary periodical which ostensibly honors the life of one Anatole Waxman-Weissman. Couple of stains to top edge. New York: Holt, Rinehart and Winston. Fine in Fine dust jacket. 1973. First Edition; First Printing. Cloth. Promotional Copy with author photo laid in; . New York: Holt Rinehart & Winston. Near Fine in Fine dust jacket. 1973. First Edition; First Printing. Cloth. Dime size stain to back endpaper from binders glue, otherwise fine; . New York: Holt, Rinehart and Winston , 1973. First printing. Hardcover. Very near Fine/Near Fine. 243 pp. Price of $6.95 on the front flap of the dust jacket. A very near Fine book in a Near Fine dust jacket with a faint sticker ghost on the front panel and a few hints of wear. New York: Holt, Rhinehart, & Winston. Hardcover. Label removed from front panel of dust jacket, o/w fine. . Fine. 1973. First Edition. New York: Holt, Rinehart and Winston, 1973. Hard Cover. Near Fine binding/Near Fine dust jacket. Previous owner bookplate signed by the author and tipped into the front hinge. Octavo. 243pp. Dust jacket protected in mylar cover. Near Fine binding / Near Fine dust jacket. New York: Holt Rinehart Winston, 1973. Hardcover. Very Good/Very Good. First edition. Very good in very good dustwrapper; Book shows slight rubbing/bumping, slightly curved panels, small light brown stains on outer pg ends, dustwrapper small brown stain on front panel, small dark stain on front flap. Please Note: This book has been transferred to Between the Covers from another database and might not be described to our usual standards. Please inquire for more detailed condition information. NY: Holt, Rinhart , & Winston, 1973 Dust jacket good, mark from sticker glue to front panel. Tan cloth with black titles and illustration. Very good, slight bumping to edges of boards. First edition, 243 pages. Published in the style of a literary quarterly magazine.. First Edition. Cloth. Very Good/Good. 8vo - over 7¾" - 9¾" tall. New York: Holt, Rinehart and Winston, 1973. Book. Fine. Hardcover. Signed by Author(s). Stated first edition, 1973. SIGNED by author Charyn on plate affixed to half title page. Fine hardcover in a NON-priceclipped near fine dust jacket. .
Holt Rinehart Winston. Hardcover. This hardcover book is square and tight. The boards and spine have no wear with pristine lettering. The pages and endpages are clean, with no markings or folds. The dustjacket is As New. Original Price is intact. Not ex-lib. No remainder mark. . Fine. 1973. First Edition. New York: Holt, Rinehart and Winston, 1973. Light foxing to edges; 243pp. Overall, a most acceptable first edition of this Charyn title. . First Edition. Hard Cover. VG+/VG+. Dalkey Archive Pr, 1995-07-01. 1st Dalkey Archive ed. Paperback. Used:Good. New York: Holt, Rhinehart and Winston, 1973. Fine/Near Fine. First edition. FIne in a near fine dustwrapper. New York: Holt, Rhinehart and Winston, 1973. Fine/Near Fine. First edition. FIne in a near fine dustwrapper with sticker offsetting on front panel. Holt, Rinehart and Winston, 1973-01-01. Hardcover . VeryGood/Very Good. Stated first edition. Signed by the author with a very brief inscription. Binding tight, text clean, dust jacket nice in mylar! Holt Rinehart & Winston, 1972-11-01. Hardcover. Good. Berkley Medallion, 1975. First Printing. Very Good condition. Quick, 1956. Signed by Paul Gallico and inscribed by the Mother of Ludmila, Baroness Ludmila von Falz-Fein. Second edition. Good condition. New York: Holt, Rinehart and Winston, 1973. Book. Fine. Original Cloth. 1st Edition. 8vo - over 7¾" - 9¾" tall. Tan cloth, lettered in black. Slightly foxed text block edges, otherwise as issued. Brown paper dust jacket as issued, now in mylar. 243 pp..
New York: Holt, Rinehart and Winston, 1973. First Edition. First printing Fine in tan cloth covered boards with black text and decorations on the spine and front board with a faint set of numbers stamped on the first free end paper possibly indicating a review copy. In a fine dust jacket with the price intact on the front flap. sticker on the front panel. DALKEY ARCHIVE. NEW. TRADE PAPERBACK. Holt, Rinehart, 1973. First. Hardbound. nearly fine with d.j. with a spot of sticker residue on the front. 243 pp. Holt, Rinehart and Winston, 1973. Book. Near Fine. Hardcover. 1st Edition. Clean and complete with no marks. Jacket is tanned on the spine..
New York: Holt, Rinehart, 1973. Book. Very Good+. hard. 1st. Part of this book appeared in Fiction, Vol 1, No 1. very good+, no dj, black-stamped pictorial tan cloth 243 pgs. Dalkey Archive Press, 1995-07. Paperback. Good. Holt Rinehart & Winston. Near Fine in Very Good dust jacket. 1973. Stated First Edition. Hardcover. 003091485X . Sticker shadow on DJ front. Clean and unmarked. Stated first edition. ; 243 pages . HARCOURT BRACE/COLLEGE DEPT. GOOD CONDITION. HARDCOVER W/JACKET. Holt Rinehart Winston. Fine in Near Fine dust jacket. 1973. First Edition; First Printing. Hardcover. Book Very Fine. No names or ANY markings. DJ with minor soil. DJ not price clipped ($6.95). ; 243 pages . NY: Holt Rinehart & Winston; (1973) Near fine in a fine dust jacket. Just slight dustiness to the top edge of the page block.. First Edition. Hard Cover. Dalkey Archive Press. PAPERBACK. 1564780783 Charyn, Jerome. Tar Baby. Normal, IL: Dalkey Archive Press, 1995. 243pp. 8vo. Paperback. Book condition: Very good. . Very Good. 1995. Dalkey Archive Press. Used - Very Good. Ships from the UK. Former Library book. Great condition for a used book! Minimal wear. 100% Money Back Guarantee. Your purchase also supports literacy charities. 243 pages. Octavo (8 1/2" x 5 1/2") issued in brown cloth with black lettering to spine and black figure to front cover. First edition. 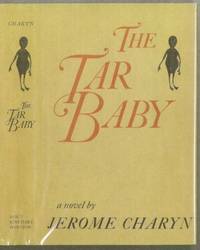 Audaciously cast in the form of a hilariously ribald parody of a literary Quarterly - including such magazine paraphernalia as ads and letters to the editor - The Tar Baby, Charyn's seventh novel, coalesces into a brilliant, story-filled novel populated by an array of brawling academics and earthy townies. Above all, it is an entertainment that will disturb and delight a college-bred generation. Jerome Charyn was born in the Bronx area of New York and was educated at Columbia (BA, 1959), where he studied history and comparative literature with a focus on Russian literature. He has written 37 novels including three memoirs about his childhood in the Bronx, The Dark Lady from Belorusse, The Black Swan, and Bronx Boy, the first two of which were named New York Times Book Of the Year. He now lives in Paris, where he taught film at the American University of Paris. He is now an Emeritus Professor there. His novel, Darlin' Bill received the Rosenthal Award from the American Academy and Institute of Arts and Letters. Over ten of Charyn's novels feature the mythic hero-cop of a surreal New York City, Isaac Sidel. His latest book of nonfiction, Sizzling Chops and Devilish Spins, was published in November 2001, and deals with Ping Pong. His personal papers are held by the Fales Library at New York University. Condition: A near fine copy in a near fine, price clipped jacket. Illinois State University: Dalkey Archive Press, 1995. A fine bright copy that looks brand new.. 1st Thus Indicated. Paperback - Bright. Fine. 12mo - over 6¾" - 7¾" tall.